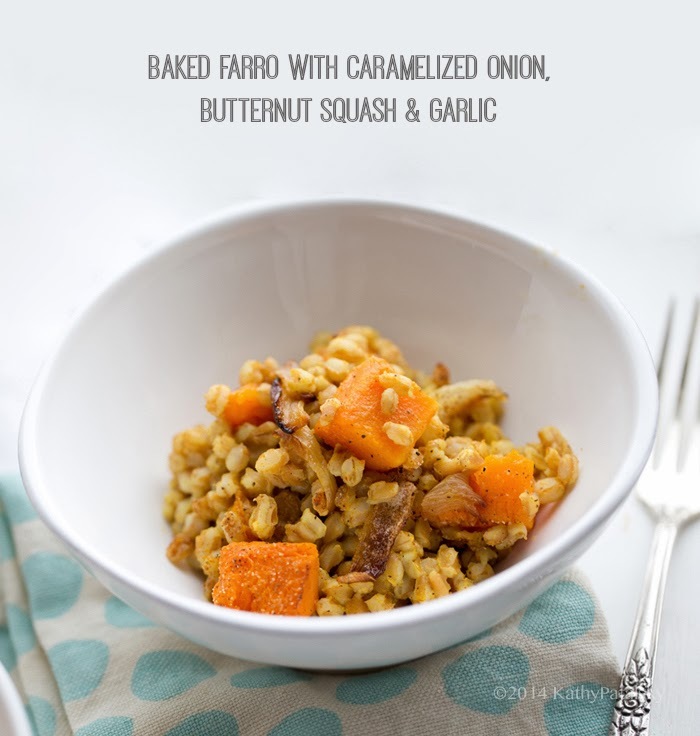 This easy and pretty simple Baked Farro dish features caramelized onions, roasted butternut squash and a hint of garlic. 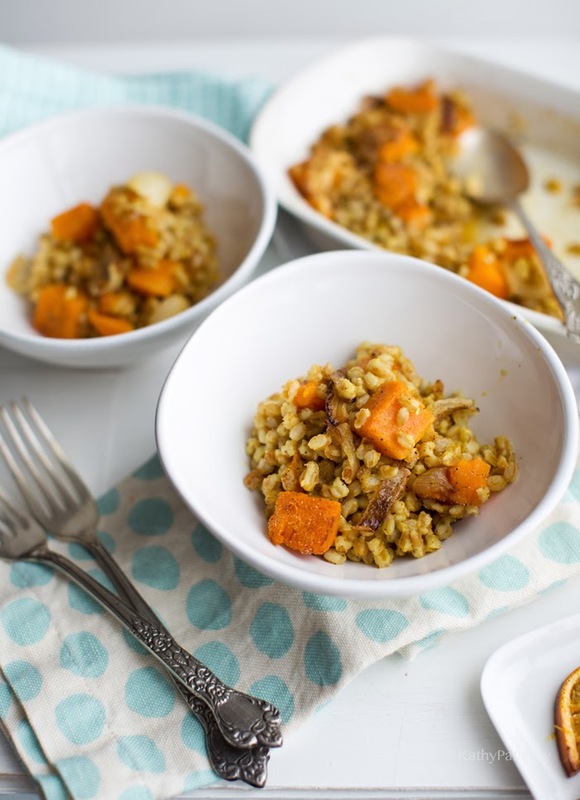 Perfect as a compliment to a veggie side dish, soup or green salad, the tender nutty farro is accented by the sweetness of squash, some peppery spices and optional ingredients like chopped nuts, mushrooms, chopped dates or dried fruit and more. Fresh herbs like sage, parsley or rosemary are lovely options too. 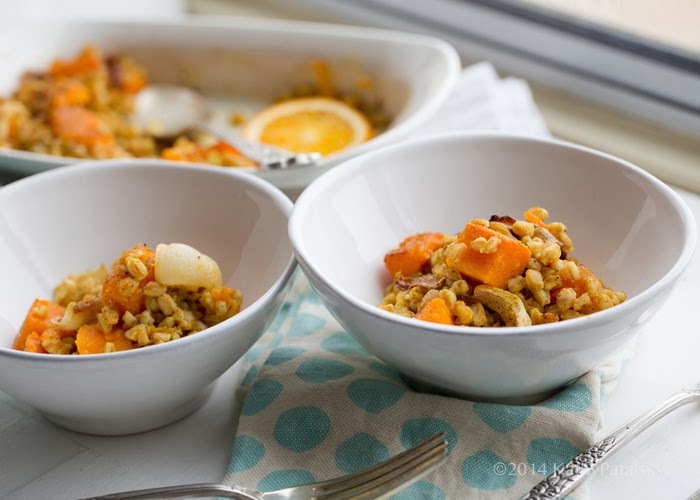 If you haven't discovered farro yet, please seek it out and fall in love!.. I adore farro. I use it for breakfast porridge, entree grain salads, tossed into green salads or even into soups. It is reminiscent of barley, but oh so much better in my opinion. 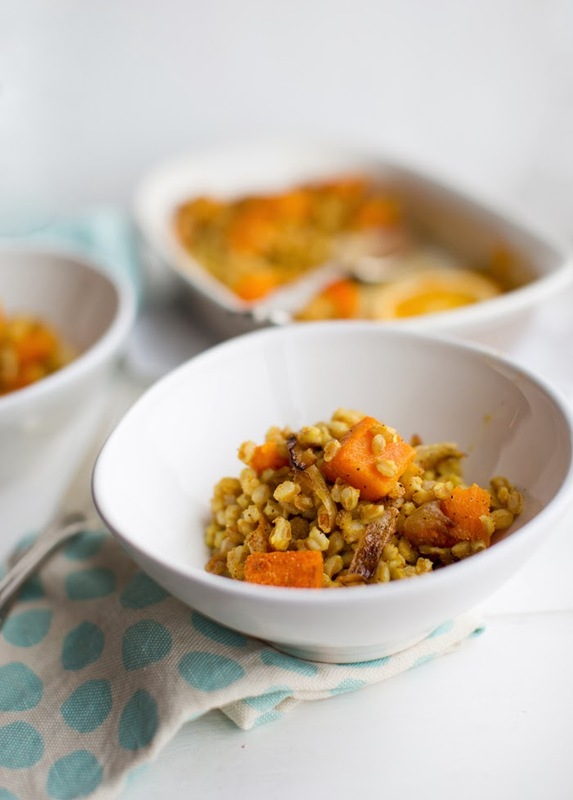 To me it feels like a cross between tender risotto rice, nutty short-grain brown rice and larger grained barley. But really, it is so unique I think it easily stands out from the crowded array of healthy grains available to us today. Farro is a low gluten, nutrient dense alternative to wheat and other grains. Farro is more protein-rich than most grains and has a nice amount of fiber. 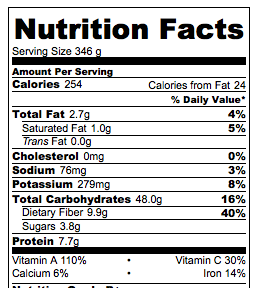 One fourth cup of dry (uncooked) farro contains 170 calories, 1g fat, 5g fiber and 6g protein. Seasoning: salt and pepper to taste + any herbs you'd like (rosemary, sage, parsley, cayenne, turmeric, cinnamon, dried or candied orange peel or orange zest and more are all lovely with this dish) You can also add a drizzle of extra virgin olive oil or more coconut oil. Nuts or dried fruit: chopped dates, slivered almonds, walnuts or dried cranberries, pistachios, orange slices would all be delish in this dish. Mushrooms: 1 cup of sliced shiitake mushrooms and a pinch of truffle salt or oil tossed with the onions to roast would be an amazing add-in! 2. Slice one butternut squash into two long halves. Note: You will only be using one half for this recipe, but you could either bake both halves and double the recipe, use the other baked half for soup or simply store the other uncooked half in the fridge for the next day or two. 3. Remove seeds from the squash halve(s) you will be baking, brush the surface in a 1/2 tsp of coconut oil and sprinkle some salt and cinnamon over top. Place the squash in a roasting pan and roast flesh side up. 4. Chop your onion and toss the chopped onion with the maple syrup, other half teaspoon of coconut oil and the garlic. Lightly spray a small roasting dish with cooking spray or rub with a bit of oil. Place onions and garlic in the dish, laying them flat in one layer. 5. Roast the butternut squash until tender enough to poke with a fork. This usually takes 30-45 minutes depending on how large your squash is. You onions only need about 15-20 minutes to caramelize, so you can either put them in the oven later or pull them early. 6. 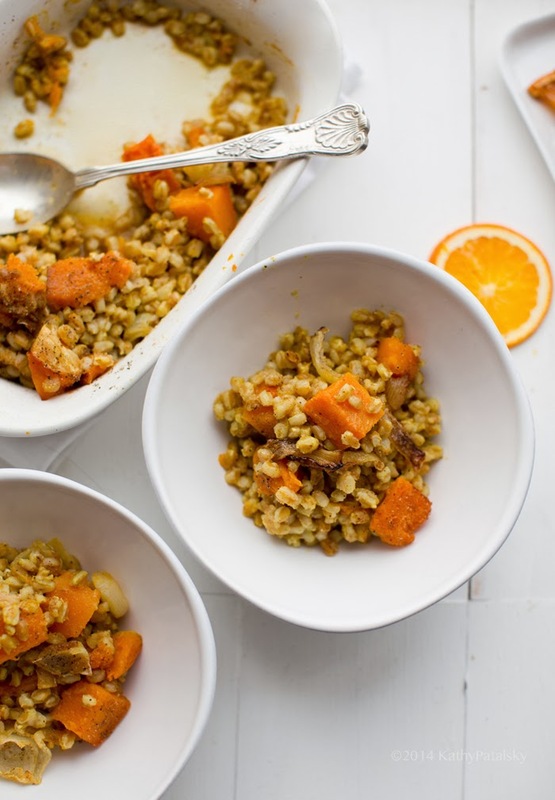 While the squash is roasting, you will prepare the farro. Place 1 cup of dry farro in a small pot along with 2 1/2 cups of either water or broth. If you use broth you will not need to salt the farro grain. If you use water, add a pinch of salt to the pot now too. Bring to a boil over medium-high heat, cover with lid and reduce to a simmer. Simmer on low for 20-30 minutes or until the liquid is absorbed and farro is tender. You will want to check on the farro about fifteen minutes into cooking, and again at 20-25 minutes. If the farro is still a bit al dente and the liquid has been absorbed, add in another 1/2 cup of liquid and keep simmering, covered, until tender. 7. When onions are caramelized (blackened edges and translucent) and squash is tender baked, pull everything from the oven but do not turn oven off. 8. Slice squash into cubes and discard skin. You can actually eat butternut squash skin, but I prefer it without skins. Add rge squash, onions and cooked farro to a large mixing bowl. Add in the salt and pepper to taste as well as any fresh or dried herbs and spices. You can add a wide variety of flavors to this easily customizable dish. I added in a few torn age leaves, some cayenne and plenty of black pepper. More garlic or garlic powder is also nice. Note: If you want your dish a bit richer, add in a drizzle of oil. 9. Toss all the ingredients together, farro, onions, squash and additional nuts or fruit and all the seasonings. Now is when you will add the additional baking liquid, toss in the orange juice or veggie broth. The juice adds a sweeter flavor, the broth more savory. Then transfer mixture to a medium or small casserole dish, cover with lid or foil and bake covered for about fifteen minutes or until all the liquid has absorbed and the flavors mix and marinate.